Coaching is more than simply learning a process and set of skills. Exceptional coaches draw on their professional experience, knowledge of organizationally relevant topics, strong helping skills, coaching-specific competencies, and most important, their ability to use their own intuition in the service of the client. Becoming an Exceptional Executive Coach is the first book that brings all of these elements together to guide readers in developing their own personal model of coaching. The book begins with the foundation for executive coaching: definitions, competencies, and topics. Readers will examine the core content areas crucial in any coach's work, from engagement and goal setting to needs assessment, data gathering, feedback, and development planning-and then learn how to combine that knowledge with the unique perspective they bring to the table as individuals in order to achieve maximum coaching effectiveness. Each chapter includes a case study that brings the practice of coaching to life. Tools include charts, development plans, contracts, and more, plus ongoing discussion of the role of coaching in organizational contexts. ..".gives all coaches at whatever level fresh ideas about how to improve their skills, also provides business leaders a good understanding of what to expect from an executive coach." 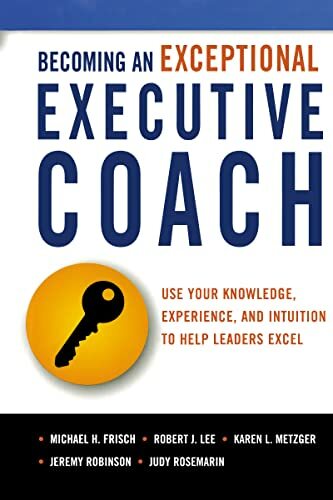 "--Kansas City Leadership Examiner"
..".if you are thinking about pursuing a career in this field, "Becoming an Exceptional Executive Coach "is a great resource..." "--Love to Know Jobs & Careers"